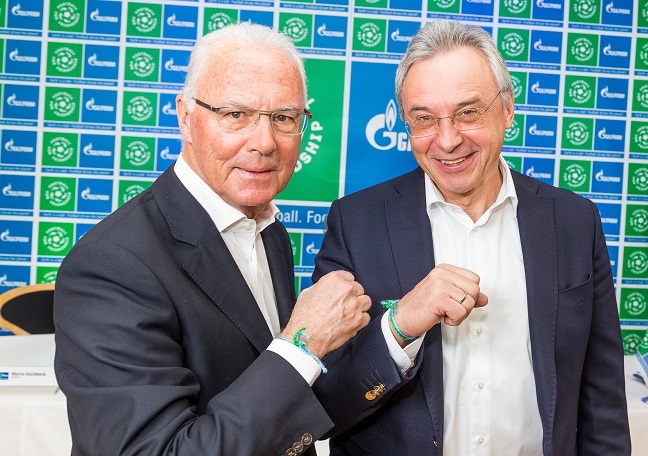 Franz Beckenbauer, the Global Ambassador of the Football For Friendship project, and Vyacheslav Krupenkov, Senior Managing Director of Gazprom Germania GmbH. Children from 32 countries to attend Football For Friendship. Gazprom, the official sponsor of the UEFA Champions League, on March 24 announced the opening of the fourth season of the Football For Friendship international children's social project. The total number of participating countries has grown from 24 last year to 32, with young footballers from Africa and South America set to take part in the project for the first time. The list of participants includes teams from Algeria, Argentina, Armenia, Austria, Azerbaijan, Belarus, Belgium, Brazil, Bulgaria, China, Croatia, the Czech Republic, France, Germany, Hungary, Italy, Japan, Kazakhstan, Kyrgyzstan, the Netherlands, Poland, Russia, Serbia, Slovakia, Slovenia, Spain, Switzerland, Syria, Turkey, Ukraine, the United Kingdom, and Vietnam. On April 25 the participating countries will celebrate the International Day of Football and Friendship, while on May 27–28 Milan will host the International Street Soccer Tournament and the Football For Friendship International Children's Forum. “Football For Friendship gives teenagers representing various cultures, customs and traditions an excellent opportunity to learn to understand and respect each other despite any and all differences,” said Alexei Miller, Chairman of the Gazprom Management Committee. The forum will culminate with the awarding of the Nine Values Cup, the special prize of the project, to one of the world’s professional football clubs for the utmost commitment to the program’s values. The participants will visit the 2016 UEFA Champions League Final at the Stadio Giuseppe Meazza (San Siro) in Milan after the forum is over. The Football for Friendship international children’s social project is implemented by Gazprom as part the Gazprom for Children program. The project is aimed at developing the youth football game and upbringing tolerance. The annual Football for Friendship international children’s forum is the major event of the project, bringing together 12- to 14-year-old players from top soccer clubs.